Harakat Ahrar al-Sham al-Islamiyya (Arabic: حركة أحرار الشام الإسلامية‎, translit. ḥarakat aḥrāru š-šām al-islāmiyah, lit. 'Islamic Movement of the Free Men of the Levant'), commonly referred to as Ahrar al-Sham, is a coalition of multiple Islamist and Salafist units that coalesced into a single brigade and later a division in order to fight against the Syrian Government led by Bashar al-Assad during the Syrian Civil War. Ahrar al-Sham was led by Hassan Aboud until his death in 2014. In July 2013, Ahrar al-Sham had 10,000 to 20,000 fighters, which at the time made it the second most powerful unit fighting against al-Assad, after the Free Syrian Army. It was the principal organization operating under the umbrella of the Syrian Islamic Front and was a major component of the Islamic Front. With an estimated 20,000 fighters in 2015, Ahrar al-Sham became the largest rebel group in Syria after the Free Syrian Army became less powerful. Ahrar al-Sham and Jaysh al-Islam are the main rebel groups supported by Turkey. On 18 February 2018, Ahrar al-Sham merged with the Nour al-Din al-Zenki Movement to form the Syrian Liberation Front. The group aims to create an Islamic state under Sharia law. While both are major rebel groups, Ahrar al-Sham is not to be confused with Tahrir al-Sham, its main rival and former ally. Before 2016, Ahrar al-Sham cooperated with the al-Nusra Front, originally an affiliate of al-Qaeda. However, from 2017 onward it increasingly fought against al-Nusra, which rebranded as Tahrir al-Sham with a former Ahrar leader, Abu Jaber, as emir, and recruited some of Ahrar al-Sham's most hardline units. The Islamic Movement of the Free Men of the Levant is an Islamist, reformist, innovative and comprehensive movement. It is integrated with the Islamic Front and is a comprehensive and Islamic military, political and social formation. It aims to completely overthrow the Assad regime in Syria and build an Islamic state whose only sovereign, reference, ruler, direction, and individual, societal and nationwide unifier is Allah Almighty's Sharia (law). According to the International Crisis Group in 2012, Ahrar al-Sham, along with the al-Nusra Front, has "embraced the language of jihad and called for an Islamic state based on Salafi principles." The group has a Syrian leadership and "emphasizes that its campaign is for Syria, not for a global jihad". However, according to US intelligence officials, a few al-Qaeda members released from prisons by the Syrian government have been able to influence actions of the group, and install operatives within the senior ranks of Ahrar al-Sham. Such ties were not disclosed publicly until January 2014, when a former senior leader of Ahrar al-Sham, the now deceased Abu Khalid al-Suri, acknowledged his long-time membership in al-Qaeda and role as Ayman al-Zawahiri's representative in the Levant. Regional expert Aymenn Jawad Al-Tamimi has speculated two factions existed within Ahrar al-Sham, a nationalist moderate faction and a Salafi Jihadi faction influenced largely by the al-Qaeda linked Abu Khalid al-Suri whom was appointed by Ayman al-Zawahiri to act as a mediator between Jabhat al-Nusra and ISIL, the faction at the time mostly existing in eastern Syria, in particular in Hasakah and having a pro-Caliphate outlook, that allied with ISIL and held ties with Ansar al-Islam with a number of Ahrar al-Sham members later joining ISIL during the group's presence there. As a result Ahrar al-Sham has been described as being diverse group in this regard, in December 2016 another Salafi faction called Jaysh al-Ahrar headed by Abu Jaber Shaykh, a senior commander in Ahrar al-Sham, split from the group and joined Hayat Tahrir al-Sham but later left HTS due to disagreements with the leadership and the resignation of the Saudi cleric Abdullah al-Muhaysini, Jaysh al-Ahrar eventually joined the National Front for Liberation alongside Ahrar al-Sham in 2018. In its first audio address, Ahrar al-Sham stated its goal was to replace the Assad government with a Sunni Islamic state. It acknowledged the need to take into account the population's current state of mind. It also described the uprising as a jihad against a Safawi plot to spread Shia Islam and establish a Shia state from Iran through Iraq and Syria, extending to Lebanon and Palestine. Ahrar al-Sham has claimed that it only targets government forces and militia and that it has cancelled several operations due to fear of civilian casualties. It provides humanitarian services and relief to local communities, in addition to pamphlets promoting religious commitment in daily life. Ahrar al-Sham leader Hassan Aboud stated that Ahrar al-Sham worked with the Nusra Front and would have no problems with al-Nusra as long as they continued fighting the regime. Aboud also said Ahrar worked with the Islamic State of Iraq and the Levant (ISIL) in some battles, but that their agenda was disagreeable. He said all parties, whether they were ISIL, al-Nusra, the Islamic Front, or the FSA, shared the same objective of establishing an Islamic state, but they differed as to the "tactics, strategies or methods". Aboud claimed that in Syria "there are no secular groups". Aboud condemned democracy in an interview with Al-Jazeera, saying that "Democracy is people governing people, according to rules they please. We say that we have a divine system whose law is Allah's for his creatures and his slaves who he appointed as viceregents on this Earth." Ahrar al-Sham, and the Islamic Front in general, issued condolences for Afghan Taliban leader Mullah Omar upon his death. In August 2015, Ahrar al-Sham commander Eyad Shaar said "We are part of Syrian society and the international community. ... We want to be part of the solution." Ahrar al-Sham's political representative stated in December 2015 that Ahrar al-Sham are "not related with al Qaeda, we only fight with them against Assad and ISIS". 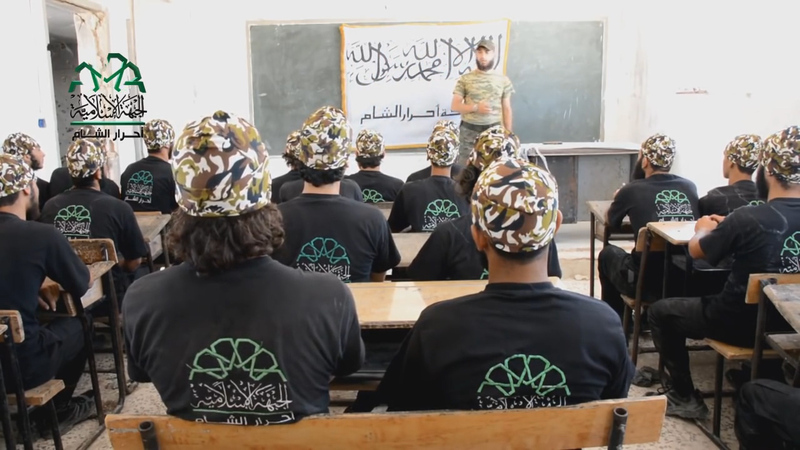 In an Amnesty International report in July 2016, Ahrar al-Sham, along with al-Nusra Front, was described as having "applied a strict interpretation of Shari'a and imposed punishments amounting to torture or other ill-treatment for perceived infractions." A political activist was abducted and detained by Ahrar al-Sham for having not worn a veil and accused of affiliation with the Syrian government. At least three children have been recorded to be abducted by Jabhat al-Nusra and Ahrar al-Sham between 2012 and 2015. Lawyers and political activists have faced reprisal attacks by Ahrar al-Sham and other Islamist rebel groups due to their political activities and perceived religious beliefs. In May 2016, Ahrar al-Sham released an address by then deputy general director Ali al-Omar in which he distinguished Ahrar al-Sham's militancy from the Salafi jihadism of al-Qaeda and ISIL, and defended its political engagement. On 18 June 2017, Ahrar al-Sham adopted Unified Arab Law in its courts in Syria. On 21 June, the group issued a fatwa permitting it to display the Syrian independence flag. Ahrar al-Sham started forming units just after the Egyptian revolution of January 2011, and before the Syrian uprising started in March 2011. Most of the group's founders were Salafist political prisoners who had been detained for years at the Sednaya prison until they were released as part of an amnesty by the Syrian Government in March–May 2011. At the time of its establishment in December 2011, Ahrar al-Sham consisted of about 25 rebel units spread across Syria. On 23 January 2012, the Ahrar al-Sham Battalions was officially announced in the Idlib Governorate. In the same announcement, the group claimed responsibility for an attack on the security headquarters in the city of Idlib. "To all the free people of Syria, we announce the formation of the Free Ones of the Levant Battalions," the statement said, according to a translation obtained by the Long War Journal. "We promise God, and then we promise you, that we will be a firm shield and a striking hand to repel the attacks of this criminal Al Assad army with all the might we can muster. We promise to protect the lives of civilians and their possessions from security and the Shabiha [pro-government] militia. We are a people who will either gain victory or die." By July 2012, the group's website listed 50 units, and by mid-January 2013, the number had increased to 83 units. Most of these units are headquartered in villages in Idlib Governorate, but many others are located in Hama and Aleppo Governorates. Some Ahrar al-Sham units that have been involved in heavy fighting include the Qawafel al-Shuhada and Ansar al-Haqq Brigades (both in Khan Shaykhun), the al-Tawhid wal-Iman Brigade (Maarat al-Nu'man, Idlib), the Shahba Brigade (Aleppo City), the Hassane bin Thabet Brigade (Darat Izza, Aleppo), and the Salahaddin and Abul-Fida Brigades (both in Hama City). Members of the group are Sunni Islamists. Ahrar al-Sham cooperates with the Free Syrian Army; however, it does not maintain ties with the Syrian National Council. Although they coordinate with other groups, they maintain their own strict and secretive leadership, receiving the majority of their funding and support from donors in Kuwait. Ahrar al-Sham was credited for rescuing NBC News team including reporter Richard Engel, producer Ghazi Balkiz, cameraman John Kooistra and others after they were kidnapped in December 2012. While Engel initially blamed pro-Assad Shabiha militants for the abduction, it later turned out that they were "almost certainly" abducted by an FSA affiliated rebel group. There were around 500 people in Ahrar al-Sham in August 2012. In January 2013, several of the member organizations of the Syrian Islamic Front announced that they were joining forces with Ahrar al-Sham into a broader group called Harakat Ahrar al-Sham al-Islamiyya (The Islamic Movement of Ahrar al-Sham). In May 2013, Ahrar al-Sham alongside Al-Nusra, ISIL and the Tawhid Brigade fought the Ghuraba al-Sham Front because of looting and corruption on behalf of Ghuraba al-Sham as well as disputes Ghuraba al-Sham had with the Aleppo Sharia Court. In September 2013, members of ISIL killed the Ahrar al-Sham commander Abu Obeida Al-Binnishi, after he had intervened to protect a Malaysian Islamic charity; ISIL had mistaken its Malaysian flag for that of the United States. On 23 February 2014, one of the top commanders and al-Qaeda representative, Abu Khalid al-Suri, was killed in a suicide bombing in Aleppo, organized by ISIL. In March 2015, the Suqour al-Sham Brigade merged with Ahrar al-Sham, but left in September 2016. Later in September, Suqour al-Sham joined the Army of Conquest, a group which also has Ahrar al-Sham as a member. On 9 September 2014, a bomb went off during a high level meeting in Idlib province, killing Hassan Abboud, the leader of the group, and 27 other senior commanders, including military field commanders, members of the group's Shura council, and leaders of allied brigades. There was no claim of responsibility for the attack. The day after the bombing Abu Jaber was announced as replacement leader. 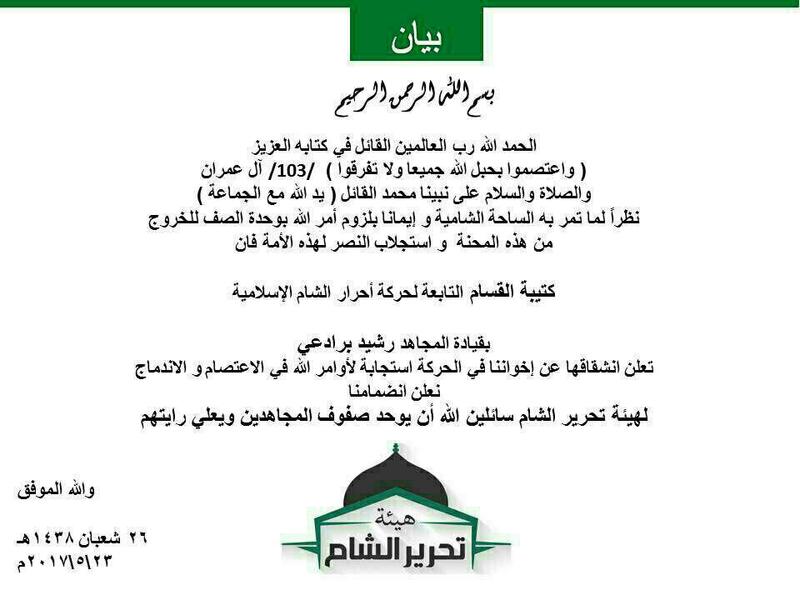 Ahrar ash-Sham received condolences from the al-Qaeda organization Nusra. Ahrar received condolences from other al-Qaeda members. In early November 2014, representatives from Ahrar al-Sham reportedly attended a meeting with al-Nusra Front, the Khorasan Group, the Islamic State of Iraq and the Levant, and Jund al-Aqsa, which sought to unite the groups against the Syrian government. However, by 14 November 2014, it was reported that the negotiations had failed. During the night of 6 November 2014, a US airstrike targeted the group for the first time, hitting its headquarters in Idlib governorate and killing Abu al-Nasr, who was in charge of receiving weapons for the group. On 24 November 2014, a US airstrike on the ISIL headquarters building in Ma'dan, Raqqa killed another Ahrar al-Sham fighter, who was being held prisoner by ISIL. The New York Times reported that the pro Al-Qaeda Saudi cleric Abdullah Al-Muhaisini ordered that Christians in Idlib were not to be killed, and that Christians were being defended by Ahrar al-Sham. However, there were subsequent unconfirmed reports of Ahrar al-Sham executing two Christians in the city. Mohannad al-Masri, known by the alias Abu Yahia al-Hamawi, was appointed leader in September 2015. Ali al-Omar, known by the alias Abu Ammar al-Omar, was appointed leader in November 2016. In October 2015, Abu Amara Brigades left the Levant Front and joined Ahrar al-Sham, having joined the Levant Front in February 2015. On 25 February 2016, a car bomb was detonated at the Russian military base in Idlib, Syria. Ahrar al-Sham claimed responsibility on their website alleging "dozens" of casualties among Russian officials. On the following day, Jaysh al-Sunna's branch in Hama merged with Ahrar al-Sham, though its northern Aleppo branch was not a part of this merger. Ahrar al-Sham was praised by Tawfiq Shahabuddin, leader of the Nour al-Din al-Zenki Movement, in October 2016. On 10 December 2016, 16 Ahrar al-Sham units under Hashim Sheikh, known by the alias Abu Jaber, formed a quasi-independent group within Ahrar called Jaysh al-Ahrar, or the Free Army, for similar reasons as Ashida'a Mujahideen Brigade leaving 3 months prior. On 23 January 2017, the al-Nusra Front attacked Jabhat Ahl al-Sham bases in Atarib and other towns in western Aleppo. All the bases were captured and by 24 January, the group was defeated and joined Ahrar al-Sham. On 25 January 2017, several factions from Jaysh al-Islam based in Aleppo left to join Ahrar, establishing the Ansar Regiment. On the same day, the remaining Fastaqim Union members of its Aleppo branch joined Ahrar al-Sham. Jaber Ali Basha and Anas Abu Malek were made deputy leaders of Ahrar al-Sham in February 2017. On 23 July 2017, Tahrir al-Sham, successor of the al-Nusra Front, expelled the remnants of Ahrar al-Sham from Idlib, capturing the entire city. On 31 July 2017, Hassan Soufan, also known by his nom de guerre "Abu al-Bara", was appointed as the leader of Ahrar al-Sham's shura council. Soufan was born in Latakia, and in 2004, Saudi Arabia extradited him to the Syrian government, which sentenced him to life imprisonment in Sednaya Prison. In December 2016, he was released as part of an agreement during which the rebels withdrew from Aleppo. Soufan was among those who temporarily split from Ahrar al-Sham as part of Jaysh al-Ahrar in the same month. On 6 August 2017, 120 Ahrar al-Sham fighters in Arbin, Eastern Ghouta defected to the al-Rahman Legion after internal disputes. Ahrar al-Sham accused the Rahman Legion of seizing their weapons, while the Rahman Legion accused Ahrar al-Sham of their attempt to implement their "failed" experience from northern Syria in eastern Ghouta. A ceasefire agreement between the Rahman Legion and Ahrar al-Sham was implemented on 9 August. Around 2,000 fighters in Ahrar al-Sham came from Hama. After its defeat in Idlib by Tahrir al-Sham in July 2017, territorial control by Ahrar al-Sham are confined to the al-Ghab Plain, Mount Zawiya, Ariha, and a number of villages in the northeastern Latakia Governorate and the western Aleppo Governorate. In August 2018, Hassan Soufan resigned as leader and deputy leader Jaber Ali Basha was promoted to replace him. On 22 June 2018, an Ahrar al-Sham commander was assassinated in al-Bab by gunmen believed to be part of the Hamza Division. Discussions about foreign support in the media often center on the weapons that foreign powers provide to their proxies. Money is just as important as weapons though. As soon as a soldier / rebel has to fight away from his home, the rebel group has to pay at least his sustenance, and in practice some more. For Ahrar the amount of financial aid it got from abroad might be the very reason it became so powerful. After the December 2013 suspension of all U.S. and the U.K. non-lethal support, which included medicine, vehicles, and communications equipment, to the Free Syrian Army after the Islamic Front, a coalition of Islamist fighters that broke with the American-backed Free Syrian Army, had seized warehouses of equipment. In 2014 the U.S. was considering indirectly resuming non-lethal aid to the moderate opposition by having it "funneled exclusively through the Supreme Military Council, the military wing of moderate, secular Syrian opposition" even if some of it ends up going to Islamist groups. Several European states have attempted small-level engagements with individual Ahrar al-Sham political officials in Turkey. Donations from supporters abroad were important for Ahrar's growth. Saudi Arabia, Qatar and Turkey have been reported to have actively supported Ahrar al-Sham. A statement issued by Ahrar al-Sham thanked Turkey and Qatar for their help. [better source needed] By 2013, the Kuwaiti private fund Popular Commission to Support the Syrian People, managed by Sheikh Ajmi and Sheik Irshid al-Hajri had supported Ahrar with US$400,000, for which Ahrar recorded a public thank you. Ahrar al-Sham is not designated a terrorist organization by the U.S. State Department, the United Nations, or the European Union. Since December 2015, the UN Security Council has been trying to assemble a list of terrorist groups in Syria. Russia, Lebanon, Iraq, Egypt, and the United Arab Emirates support classifying Ahrar al-Sham as a terrorist group, but they have not been able to achieve a unanimous consensus. Ahrar al-Sham's relationships with U.N. designated terrorist organizations has been, and continues to be, a key point of contention in U.S. and Russian foreign relations and in their Syrian ceasefire negotiations. The U.S. Department of State has said that "Ahrar al-Sham is not a designated foreign terrorist organization". However, some U.S. officials have reportedly considered designating it as a terrorist organization because of its links to al-Qaeda subgroups such as the al-Nusra Front. From Orlando to San Bernardino to the Philippines and Bali, we’ve seen pictures and we’ve heard testimony of shocking crimes committed by al-Qaida, by Boko Haram, by Jaysh al-Islam, by Ahrar al-Sham, by al-Shabaab, Daesh, other groups against innocent civilians, against journalists, and against teachers particularly. It was reported that administration officials disapproved this mention and thought that it would potentially harm the U.S. government efforts to convince the Russians and the Syrian government not to attack Ahrar al-Sham with one senior administration official reportedly saying that despite the fact that "for months, we’ve been arguing to make sure the Russians and the Syrian regime don’t equate these groups with the terrorists, Kerry's line yields that point." Explaining these comments, US State Department spokesman John Kirby said that "secretary Kerry was simply trying to describe the complexity of the situation in Syria, noting that we aren't blind to the notion that some fighters shift their loyalties." It was also reported that some Syrian groups see Kerry's comments as an example of how the Obama administration has slowly moved toward the Russian view of Syria, which includes painting all opposition groups as terrorists in order to justify attacking them. Although Ahrar al-Sham is not officially designated as a terrorist organization in Germany, on 6 October 2016 a German court has convicted four German-Lebanese men who supplied the group in Syria of "supporting a terrorist organization", and, on 30 March 2017, two Syrian refugees who were members of Ahrar al-Sham were placed on trial in Munich, Germany for being members of a terrorist organization. According to the prosecutor, the goal of the group is to "overthrow the Syrian president Bashar al-Assad and establish an Islamic regime". Ahrar al-Sham had worked with ISIL until the two groups began their present-day hostilities with one another in January 2014. However, since late 2016, Al-Nusra and Ahrar al-Sham have been increasingly rivalrous, with military clashes between them taking place in the Idlib Governorate in January–March 2017 and July 2017. ^ a b c "Syria's Ahrar al-Sham Leadership Wiped Out in Bombing". Carnegie Endowment of International Peace. 9 September 2014. Retrieved 10 September 2014. ^ a b c "TIME Exclusive: Meet the Islamist Militants Fighting Alongside Syria's Rebels". Time. 26 July 2012. Retrieved 19 January 2014. ^ a b c d e f g h i "Ahrar al-Sham". Mapping Militant Organizations. Stanford University. Retrieved 14 February 2016. ^ a b Ghanmi, Elyès; Punzet, Agnieszka (11 June 2013). "The involvement of Salafism/Wahhabism in the support and supply of arms to rebel groups around the world" (PDF). European Parliament. At the beginning of 2012 two prominent Salafi armed groups emerged: Jabhat al-Nusra (the Support Front) and Kata’ib Ahrar al-Sham (the Freemen of Syria Battalions) both of which embraced the language of jihad and called for an Islamic state based on Salafi principles (International Crisis Group, 2012). ^ a b "أحرار الشام تحلل تبني علم الثورة كرمز وتوقعات بتبديل رايتها إليهo". Al Etihad Press. 21 June 2017. ^ a b Lund, Aron (5 October 2012). "Holy Warriors". Foreign Policy. Retrieved 26 December 2012. ^ a b "The crowning of the Syrian Islamic Front". Foreign Policy. 24 June 2013. Retrieved 27 June 2013. ^ a b "Suicide bombing kills head of Syrian rebel group". The Daily Star. 9 September 2014. Retrieved 9 September 2014. ^ a b c d e f "Competition among Islamists". The Economist. 20 July 2013. Retrieved 9 September 2014. ^ Lund, Aron (12 September 2015). "Abu Yahia al-Hamawi, Ahrar al-Sham's New Leader". Syria Comment. Retrieved 17 September 2015. ^ a b c d "Commander-in-Chief of Ahrar Al-Sham appoints his deputies and a new leader for the northern sector". Zaman al-Wasl. 4 February 2017. ^ a b Hashem Osseiran (3 August 2017). "Why One of Syria's Biggest Rebel Groups Reordered Its Leadership". Syria Deeply. ^ a b c "Jaber Ali Basha succeeds Hassan Soufan in Ahrar Al-Sham leadership". Enab Baladi. 17 August 2018. Retrieved 18 August 2018. ^ a b Charles Lister [@Charles_Lister] (3 February 2017). "Ahrar al-Sham has elected a new deputy leader, @JaberAliBasha - the former leader of Ahrar's Islamic Commission in…" (Tweet) – via Twitter. ^ a b Charles Lister [@Charles_Lister] (3 February 2017). "#pt: Ahrar al-Sham also elected a 2nd Deputy, @Anasabomalek2, who has previously held several positions in Ahrar's…" (Tweet) – via Twitter. ^ "Rebels, regime made prisoner swap in Aleppo: source". Zaman al-Wasl. 21 June 2016. Retrieved 21 November 2018. ^ a b "Report: Airstrikes target another Islamist group in Syria". CNN. 6 November 2014. Retrieved 9 November 2014. ^ "List of armed formations, which joined the ceasefire in the Syrian Arab Republic on 30 December 2016". Ministry of Defence of the Russian Federation. Retrieved 30 December 2016. ^ Sami Moubayed (29 January 2017). "Is Syria's Idlib being groomed as Islamist killing ground?". Asia Times. "Last January, Idlib sank into a "rebel civil war" as fighting broke out between Jabhat al-Nusra and the Turkish-backed Ahrar al-Sham, a militia in the Syrian north that boasts of a powerbase of at least 20,000 fighters." ^ Charles Lister (15 March 2017). 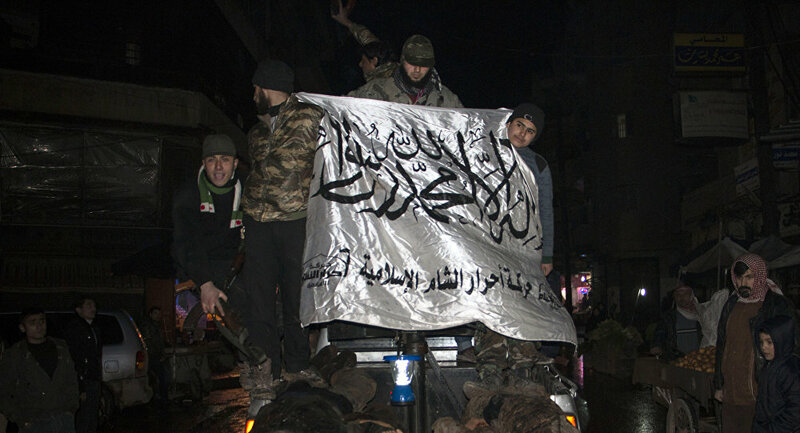 "Al Qaeda Is Starting to Swallow the Syrian Opposition". Foreign Policy. "HTS and Ahrar al-Sham are the most militarily powerful, with the former likely commanding 12,000 to 14,000 fighters and the latter closer to 18,000 to 20,000." ^ Aaron Y Zelin (June 2017). "How Al Qaeda survived drones, uprisings and the Islamic State" (PDF). Washington Institute for Near East Policy. "Overnight [after its January 2017 expansion], Ahrar al-Sham had gained approximately 8,000 additional fighters to supplement its already large membership of 12,000." ^ "The Syrian Islamic Front: A New Extremist Force". Washington Institute for Near East Policy. 4 February 2013. Retrieved 23 March 2018. ^ "Syria Comment » Archives The Dawn of Freedom Brigades: Analysis and Interview - Syria Comment". Syria Comment. Retrieved 23 May 2016. ^ Aron Lund (23 March 2015). "Islamist Mergers in Syria: Ahrar al-Sham Swallows Suqour al-Sham". Carnegie Endowment for International Peace. Retrieved 23 May 2016. ^ a b "Leading Syrian rebel groups form new Islamic Front". BBC. 22 November 2013. Retrieved 22 November 2013. 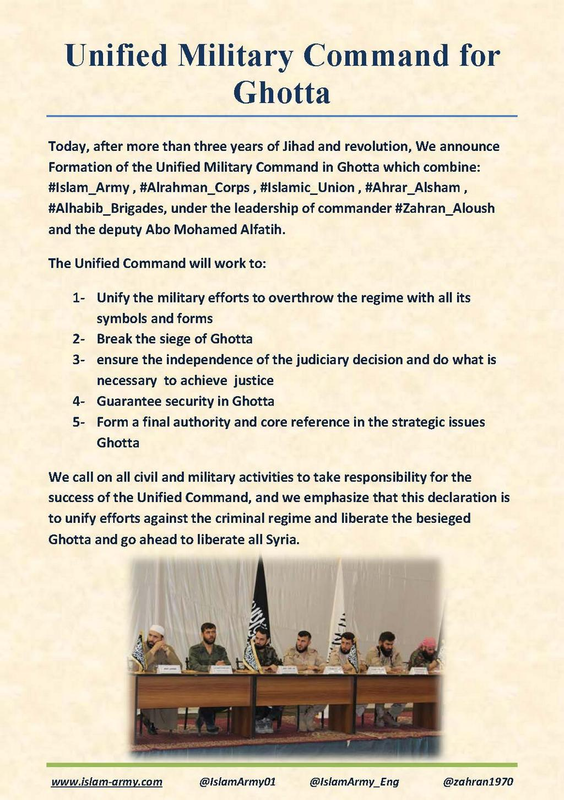 ^ "Unified Military Command for Ghotta" (PNG). Malcolmxtreme.files.wordpress.com. Retrieved 29 March 2016. ^ "The wars of the Eastern Ghouta grind on". The Daily Star Newspaper. ^ "The Army of Islam Is Winning in Syria". Foreign Policy. ^ Aron Lund (24 September 2013). "New Islamist Bloc Declares Opposition to National Coalition and US Strategy". Syria Comment. Retrieved 25 September 2013. ^ "Freedom, Human Rights, Rule of Law: The Goals and Guiding Principles of the Islamic Front and Its Allies". Democratic Revolution, Syrian Style. 17 May 2014. Retrieved 17 May 2014. ^ "NGO: Syria jihadists kill rebels in bombing". Al Arabiya. 11 January 2014. Retrieved 12 January 2014. ^ "Al Qaeda's chief representative in Syria killed in suicide attack". Long War Journal. 23 February 2014. Retrieved 9 September 2014. ^ a b syriaanalyst, Author (12 May 2017). "Update: Rebel Infighting in East Ghouta". ^ a b "Syrian rebels call for regional alliance against Russia and Iran". Reuters. ^ "Former Guantanamo detainee killed while leading jihadist group in Syria". Long War Journal. 4 April 2014. Retrieved 19 May 2014. ^ a b O'Bagy, Elizabeth (2012). Middle East Security Report: Jihad in Syria (PDF). 6. Washington, DC. p. 27. Archived from the original (PDF) on 27 March 2014. Retrieved 21 September 2012. ^ Lund, Aron (17 June 2013). "Freedom fighters? Cannibals? The truth about Syria's rebels". The Independent. London. Retrieved 20 January 2014. ^ "REPORT The Road to a Syria Peace Deal Runs Through Russia". Foreign Policy. Retrieved 14 February 2016. ^ a b c "THE SYRIAN OPPOSITION'S POLITICAL DEMANDS". Institute for Study of War. ^ Chabkoun, Malak (17 September 2014). "Syrian Revolution's Path after Attacks on Ahrar al-Sham". Al Jazeera Center for Studies. Retrieved 18 March 2017. ^ "Syrian rebel leader was bin Laden's courier, now Zawahiri's representative". The Long War Journal. 17 December 2013. Retrieved 18 December 2013. ^ a b c d Spencer, Richard (20 January 2014). "Syria's duplicity over al-Qaeda means West will not trust Assad". The Daily Telegraph. London. Retrieved 20 January 2014. ^ Sherlock, Ruth (20 January 2014). "Syria's Assad accused of boosting Al-Qaeda with secret oil deals". The Daily Telegraph. London. Retrieved 20 January 2014. ^ a b "Statement from Zawahiri's representative shows Syrian rebel group tied to al Qaeda". 18 January 2014. Retrieved 20 January 2014. ^ a b c "Tentative jihad: Syria's fundamentalist opposition". Middle East Report No 131. International Crisis Group. 12 October 2012. Retrieved 19 March 2017. ^ "Syrian rebels seek refuge in religion". Financial Times. 9 August 2012. Retrieved 21 September 2012. ^ Talk to Al Jazeera - Hassan Abboud: 'We will fight for our rights'. YouTube. 21 December 2013. ^ الجزيرة - لقاء رئيس الهيئة السياسية في الجبهة الإسلامية - Talk To Al Jazeera - YouTube. YouTube. 22 December 2013. ^ Talk to Al Jazeera. "Hassan Abboud: 'We will fight for our rights'". aljazeera.com. ^ "LiveLeak.com - Talk to Al Jazeera - Hassan Abboud: 'We will fight for our rights' (comments )". liveleak.com. ^ Zelin, Aaron Y.; Lister, Charles (24 June 2013). "The Crowning of the Syrian Islamic Front". The Washington Institute. ^ John Rossomando (11 December 2013). "IPT Exclusive: Jihad-Supporting Imam Raised Millions on U.S. Fundraising Tour". The Investigative Project on Terrorism. ^ Ghosts of Aleppo (Full Length). YouTube. 30 September 2014. ^ "Jihadists in Syria honor Mullah Omar, praise Taliban's radical state". The Long War Journal. ^ Westall, Sylvia (1 August 2015). Lidstone, Digby (ed.). "Syrian Islamist group Ahrar al-Sham mourns Taliban leader". Beirut: Reuters. ^ "Syrian Islamist rebel group looks to the west". Financial Times. 14 August 2015. ^ "Syria Talks: Rebel Negotiations In Saudi Arabia Exclude Key Players In Syrian Opposition". International Business Times, 13 December 2015. Retrieved 27 January 2016. ^ Heller, Sam (6 June 2016). "How Ahrar al-Sham Has Come to Define the Kaleidoscope of the Syrian Civil War". War on the Rocks. Retrieved 18 March 2017. ^ ""Ahrar al-Sham" adopt "unified Arab law" in the courts". Enab Baladi. 18 June 2017. ^ Blanford, Nicholas (10 October 2013). "Jihadis may want to kill Assad. But is he lucky to have them?". csmonitor.com. Retrieved 7 January 2014. ^ a b Bar, Herve (13 February 2013). "Ahrar al-Sham jihadists emerge from shadows in north Syria". The Daily Star. Beirut. AFP. Retrieved 19 March 2017. ^ Bill Roggio (26 February 2012). "Al Nusrah Front claims suicide attack in Syria". The Long War Journal. Retrieved 25 March 2012. ^ Lund, Aron (March 2013). "Syria's salafi insurgents: The rise of the Syrian Islamic Front" (PDF). Swedish Institute of International Affairs. Archived from the original (PDF) on 31 March 2014. Retrieved 22 March 2013. ^ Spencer, Richard (16 August 2012). "British convert to Islam vows to fight to the death on Syrian rebel front line". London: The Daily Telegraph. Retrieved 11 September 2012. ^ Abouzeid, Rania (18 September 2012). "Syrian Anti-Assad Rebel Groups Funded by Saudi Arabia, Qatar". Time. Retrieved 22 November 2013. ^ "Going Rogue: Bandits and Criminal Gangs Threaten Syria's Rebellion". Time. 30 July 2012. Retrieved 11 September 2012. ^ Spencer, Richard. "British convert to Islam vows to fight to the death on Syrian rebel front line". Telegraph. Retrieved 29 March 2016. ^ "Islamic Forces In Syria Announce Establishment Of Joint Front Aimed At Toppling Assad, Founding Islamic State; Syrian Website Urges Them To Incorporate All Islamic Forces In Country". MEMRI. 26 December 2012. Retrieved 9 September 2014. ^ Luca, Ana Maria (11 November 2013). "Message from Ayman al-Zawahiri". NOW News. Retrieved 22 January 2014. ^ Jeremy Binnie (18 August 2013). "Hardline Islamists down Syrian jet with Chinese MANPADS - IHS Jane's 360". Janes.com. Archived from the original on 3 December 2013. Retrieved 22 November 2013. ^ Spencer, Richard (14 November 2013). "Al-Qaeda-linked rebels apologise after cutting off head of wrong person". Telegraph. London. Retrieved 29 December 2013. ^ "ISIS accidentally beheads allied rebel fighter". Al Bawaba. 14 November 2013. Retrieved 22 November 2013. ^ "تغريدات للشيخ(أبو عبد الملك)شرعي أحرار الشام عن (الجبهة الإسلامية)". Archived from the original on 3 December 2013. Retrieved 22 November 2013. ^ Barbara Surk (10 December 2013). "Syrian army pounds rebels near Lebanon border". Associated Press. Retrieved 17 December 2013. ^ "Avashin ISIS kills number of Ahrar Al Sham… | YALLA SOURIYA". Yallasouriya.wordpress.com. 10 December 2013. Retrieved 17 December 2013. ^ "#BREAKING: Intense clashes between #ISIS and Ahrar al-Sham in Maskana town #Aleppo north of #Syria to seize control on Jarah Airport : zaidbenjamin". Inagist.com. 9 December 2013. Archived from the original on 19 December 2013. Retrieved 17 December 2013. ^ "Top al-Qaeda operative killed in Syria attack". Al Arabiya. 23 February 2014. Retrieved 24 February 2014. ^ "اندماج حركتي أحرار الشام وصقور الشام". ^ a b "Islamist Mergers in Syria: Ahrar al-Sham Swallows Suqour al-Sham". Carnegie Endowment for International Peace. 23 March 2015. Retrieved 26 April 2015. ^ "Sham Hawks Brigade split from the Islamic Movement of the Free Levant". Eldorar. 3 September 2016. ^ "(The Hawks) return to (the army of conquest)". All4Syria. 28 September 2016. ^ "Syria rebels name slain leader's replacement". Al Jazeera English. 9 September 2014. Retrieved 26 April 2015. ^ Syrian Civil War: 'At Least 45' Killed as Blast Hits Meeting of Islamist Insurgents International Business Times. 9 September 2014. Retrieved 2014-09-09. ^ Joscelyn, Thomas (10 September 2014). "Al Nusrah Front releases eulogy commemorating Ahrar al Sham leaders". Long War Journal. Foundation for Defense of Democracies. ^ Joscelyn, Thomas (9 September 2014). "Al Qaeda members mourn Ahrar al Sham, Islamic Front leaders on Twitter". Long War Journal. Foundation for Defense of Democracies. ^ Joscelyn, Thomas (9 September 2014). "Head of Islamic Front, other senior leaders killed in explosion". Long War Journal. Foundation for Defense of Democracies. ^ "AP sources: IS, al-Qaida reach accord in Syria". 13 November 2014. Archived from the original on 16 November 2014. Retrieved 13 November 2014. ^ Master. "Negotiations failed between the IS, Jabhat al-Nusra and Islamic battalions". Syrian Observatory For Human Rights. Archived from the original on 19 December 2014. ^ "An Anxious Wait in Syrian City Held by Insurgents". The New York Times. 31 March 2015. ^ Master. "The leading figure in Jabhat al- Nusra Abdullah al- Muhaysini calls for the clarion call and promises of heroics in the confrontations between the Russians and Muslims". Syrian Observatory For Human Rights. ^ "Syrian Rebel Group Ahrar al-Sham Executes Christians in "Liberated" Idlib - PJ Media". PJ Media. ^ "Assyrian Observatory: Ahrar al-Sham Movement executes Christian man and son in Syria's Idlib - (MCN)". mcndirect.com. Archived from the original on 25 November 2015. ^ "7 fighters, including Abu Abdul Rahman Salqeen a leader in Ahrar al-Sham, killed in a Salqeen city". 14 July 2015. Retrieved 15 July 2015. ^ "Twin suicide attack kills senior rebel leader in northern Syria". 15 July 2015. Retrieved 15 July 2015. ^ Lund, Aron (12 September 2015). "Abu Yahia al-Hamawi, Ahrar al-Sham's New Leader". Syria Comment. Retrieved 1 October 2015. ^ El Deeb, Sarah (30 November 2016). "The Latest: Turkey says 2 soldiers missing in Syria". AP. Retrieved 30 November 2016. ^ "Officially , "Abu Amara" battalion joins Ahrar al-Sham and calls on Aleppo factions to Unify". Eldorar. 20 October 2015. ^ Joscelyn, Thomas (25 October 2015). "Al Nusrah Front, Ahrar al Sham, Ajnad al Sham form anti-Russian alliance in Damascus countryside". Long War Journal. ^ Rabinovich, Abraham. "Jihadi Factions in Syria Claim to Have Killed Several Russian Officers in Car Bomb Explosion". Free Beacon. Retrieved 14 March 2016. ^ a b archicivilians [@archicivilians] (26 February 2016). "#Syria: Jaysh al-S unna (+500 fighters) joined Ahrar al-Sham Movement (largest Syrian Opposition Islamist force)" (Tweet) – via Twitter. ^ "The Army of the Sunnah and the movement of Ahrar Al Sham are the "Army of Faith" in the center and north of Syria". ARA News. 27 February 2016. ^ "Syria: armed opposition group committing war crimes in Aleppo - new evidence". Amnesty International UK. 13 May 2016. Retrieved 16 May 2016. ^ a b c "Rebels seize Alawite village in Syria, abduct civilians: Observatory". Reuters. 12 May 2016. Retrieved 1 June 2016. ^ a b Ahrar al-Sham "Syrian opposition forces massacre, kidnap 120 civilians in southern Hama". Al-Masdar News. 12 May 2016. Retrieved 1 June 2016. ^ "French MP Condemns 'Moderates' Massacre in Alawite Village in Syria". Sputnik News. 16 May 2016. Retrieved 1 June 2016. ^ "International Military Review – Syria, 13 May 2016". South Front blog. 13 May 2016. Retrieved 1 June 2016. ^ izat [@ischark] (21 September 2016). "Ashida'a Mujahideen Brigade abandons Ahrar Al-Sham because it no longer trusts its Sharia council due to their supp…" (Tweet) – via Twitter. ^ Aron Lund [@aronlund] (10 February 2017). "In Oct. 2016, he lauded Ahrar as a counterweight to a full jihadi takeover—you'll never believe what happened next!…" (Tweet) – via Twitter. ^ "Split lid integration within the "Islamic Ahrar al-Sham" movement". Enab Baladi. 10 December 2016. ^ Lund, Aron (14 December 2016). "Divided, they may fall". Diwan. Carnegie Middle East Center. Retrieved 19 December 2016. ^ Aymenn J Al-Tamimi [@ajaltamimi] (21 January 2017). "#Syria: Four Ahrar al-Sham battalions reportedly defect to Jabhat Fatah al-Sham" (Tweet) – via Twitter. ^ a b "جيش المجاهدين يعلن انضمامه لحركة أحرار الشام - وكالة قاسيون للأنباء". ^ Putintin [@putintintin1] (25 January 2017). "groups are (Zoubair Ibn Awam,Captain Jalal,Martyr Hassan Bakour,Allahu Akbar,Dera al-Ummah) battalions #Syria" (Tweet) – via Twitter. ^ a b c d Tamer Osman (8 February 2017). "Syrian rebel groups see necessity in consolidating ranks". Al-Monitor. Retrieved 9 February 2017. ^ Syrian Rebellion Obs [@Syria_Rebel_Obs] (26 January 2017). "#SRO - As #JFS leading its war in #Idlib gov', many factions seeking refuge inside Ahrar ash-Sham : these five sunn…" (Tweet) – via Twitter. ^ Michael Horowitz [@michaelh992] (26 January 2017). "Another Brigade initially from Darayya also joins Ahrar al-Sham #Syria" (Tweet) – via Twitter. ^ "US says it killed 11 al-Qaeda operatives in Syria air strikes". BBC News. ^ BBC (9 February 2017). "US 'kills Osama Bin Laden ally in Syria'". The Star, Kenya. ^ Gaydos, Ryan (9 February 2017). "US airstrike in Syria kills Al Qaeda leader with ties to bin Laden, Pentagon says". Fox News. ^ Yusha Yuseef 🇸🇾 [@MIG29_] (4 February 2017). "Abo Hani Al-Masri , Egyptian , military commander in Ahrar ALsham killed by US Drone strike in Sarmada in Edlib CS" (Tweet) – via Twitter. ^ "Comments". Facebook. الاعلام الحربي المركزي. Retrieved 9 February 2017. ^ Joscelyn, Thomas (8 February 2017). "Pentagon: 11 al Qaeda terrorists killed in airstrikes near Idlib, Syria". Long War Journal. Foundation for Defense of Democracies. ^ "New issue of Anṣār al-Sharī'ah in the Arabian Peninsula's newspaper: "al-Masrā #39"". Jihadology. 8 February 2017. ^ Thomas Joscelyn [@thomasjoscelyn] (8 February 2017). "2. *Key Point*: Jihadis identified Abu Hani al Masri as one of Ahrar al Sham's military leaders. See, for example:" (Tweet) – via Twitter. ^ John Arterbury [@JohnArterbury] (8 February 2017). "Egyptian media reports via activists al-Masri was Afghan, Bosnia, Chechnya vet who spent time in Egyptian prison" (Tweet) – via Twitter. ^ Putintin [@putintintin1] (4 February 2017). "#Syria Abu Hani al-Masri a commander in Ahrar al-Sham was killed in coalition airstrike today near Batbo,he has bee…" (Tweet) – via Twitter. ^ Putintin [@putintintin1] (4 February 2017). "#سوريا القيادي في احرار الشام ابو هاني المصري الذي قتل في غارة لطيران التحالف اليوم قرب باتبو شمال ادلب" (Tweet) – via Twitter. ^ Putintin [@putintintin1] (4 February 2017). "he was Egyptian Jihadi in Afghanistan,Somalian and Chechen who was imprisoned in Egypt and released in 2012 then joined Ahrar al-Sham" (Tweet) – via Twitter. ^ "Security tension in Al-Ghouta after the joining of a battalion of "Ahrar Al Sham" to "Corps of the Lord"". Asharq al-Awsat. 7 August 2017. ^ "The split of dozens of elements from the free Cham and their joining the "Corps of Rahman"". El-Dorar al-Shamia. 6 August 2017. ^ "The agreement terms implemented with Failaq al-Rahman , Senior commander of Ahrar al-Sham tells AlDorar". Al-Dorar al-Shamia. 10 August 2017. ^ Tariq Abu Ziad (12 November 2017). ""Ahrar Al Sham" retreats to the role of observer". Enab Baladi. ^ "Officially , "Abu Amara" battalion joins Ahrar al-Sham and calls on Aleppo factions to Unify - Eldorar Alshamia". ^ "ألوية صقور الشام تنفصل عن حركة أحرار الشام الإسلامية". 3 September 2016. ^ "US and UK suspend non-lethal aid for Syria rebels". BBC News. 11 December 2013. Retrieved 14 September 2016. ^ Mark Landler (9 January 2015). "U.S. Considers Resuming Nonlethal Aid to Syrian Opposition". The New York Times. Retrieved 14 September 2016. ^ a b "Syrian Islamists reach out to the U.S., but serious issues remain". Brookings Institution. ^ Hassan Ridha [@sayed_ridha] (24 August 2015). "AhrarSham releases statement regarding its stance on the political situation in #Syria" (Tweet) – via Twitter. ^ "List of terror groups published by UAE". Gulf News. 16 November 2014. ^ "Russia Urges Syrian Rebels to Separate From 'Terrorists'". The New York Times. Associated Press. 14 September 2016. Retrieved 17 September 2016. ^ "Daily Press Briefing". U.S. Department of State. 24 May 2016. Archived from the original on 25 May 2016. Retrieved 27 May 2016. ^ a b "Remarks at the Aspen Ideas Festival and Conversation with Walter Isaacson". U.S. Department of State. Retrieved 4 September 2016. ^ a b c "Kerry touts the Russian line on Syrian rebel groups". Retrieved 4 September 2016. ^ "Daily Press Briefing - 12 July 2016". U.S. Department of State. Retrieved 4 September 2016. ^ Wladimir van Wilgenburg (31 March 2017). "Syrian Ahrar al-Sham members on trial in Germany for terrorism". ARA News. ^ "Al-Qaeda's Abu Khaled al-Suri killed by suicide bomb in Syria". Daily Mail. Retrieved 18 August 2016. ^ Aryn Baker (24 February 2014). "Al Qaeda's Top Envoy Killed in Syria by Rival Rebel Group". Time. Retrieved 14 September 2016. The Syrian-born al-Suri had another role in helping lead one of the most effective fighting groups in Syria today, the Ahrar al-Sham brigade. Officially, Ahrar al-Sham has no affiliation with al-Qaeda, but Zawahiri was able to influence the rebel group's actions through al-Suri. It was a savvy management move that gave al-Qaeda flexibility on the Syrian front. ^ Reuters. "Russia blocked in bid to blacklist Syria rebels". Al Arabiya Network. Retrieved 14 September 2016. Ahrar al-Sham, whose late leader fought alongside Osama bin Laden, last year denied sharing al Qaeda's ideology or having organizational ties to the group. ^ "Russian attempt to blacklist Syria's Islamist rebels blocked". The New Arab. 11 May 2016. Retrieved 14 September 2016. ^ Josh Wood. "Syria truce threatened by Nusra's growing acceptance among rebels". The National. Retrieved 14 September 2016. The powerful Islamist group Ahrar Al Sham, a longtime ally of Fatah Al Sham that has recently been in talks about a merger, has also rejected the ceasefire. ^ "As Syria truce holds, Al-Qaeda affiliate denounces it". Al Arabiya Network. Associated Press. Retrieved 14 September 2016. A Jabhat Fatah al-Sham commander in the northern province of Aleppo told The Associated Press the group could announce its merger with the ultraconservative Ahrar al-Sham group "in the near future." He spoke on condition of anonymity because he was not allowed to speak publicly about the talks. A senior Ahrar al-Sham official also confirmed the talks, adding that such a merger would cover a large number of factions, not just his group. "The merger will not be bilateral. ... It is a project to unify the factions on the battlefield. If it holds, all factions will melt into one," said the official, who spoke on condition of anonymity because the talks are ongoing. ^ Leith Fadel (9 September 2016). "Ahrar Al-Sham officially rejects Syrian ceasefire". Al-Masdar News. Retrieved 14 September 2016. ^ "Ten brigades and battalions of the FSA join Jaysh al Mujahideen • /r/syriancivilwar". ^ Chris Tomson AlMasdar (23 May 2016). "Free Syrian Army factions in northern Aleppo merge to Jaish al-Mujahideen" – via YouTube. ^ a b @Syria_Rebel_Obs (25 January 2017). "As JFS leading its war in Idlib gov', many factions seeking refuge inside Ahrar ash-Sham : these five sunni factions merged in it" (Tweet) – via Twitter. ^ الجناح الكوردي [@aljanahalkurdy] (29 January 2017). "#الجناح_الكوردي #أحرار_الشام ❌ لاصحة لما تتداوله بعض وسائل الإعلام عن إنضمام الجناح الكوردي لهيئة تحرير الشام❌ #الجناح_الكوردي_لأحرار_الشام" (Tweet) – via Twitter. ^ "New statement from Ḥarakat Aḥrār al-Shām al-Islāmīyyah: "About the Joining of a Constellation of Major Factions To Our Group"". Jihadology. 26 January 2017. ^ "Farouk Brigades Joins Ahrar Al-Sham Movement - Qasion News Agency". ^ "FSA-affiliated group joins Al-Qaeda coalition; making it the largest militant group in Syria". 21 March 2017. ^ archicivilians [@archicivilians] (29 January 2017). "Note: The main #AhrarAlSham force is Al-Eman Army, which is considered as Ahrar's main body, included in this…" (Tweet) – via Twitter. ^ "Omar Farouq Brigade calls on Muslims to wage jihad in Syria - FDD's Long War Journal". ^ "Are Syria's Salafi movements witnessing a split?". 13 November 2015. ^ "Jaysh al-Sham to join the Islamic Movement of Ahrar al-Sham". en.eldorar.com. ^ "Jaish al-Sham: An Ahrar al-Sham Offshoot or Something More?". ^ "New mergers in northern #Syria". en.eldorar.com. ^ a b "Several military formations join of Ahrar al-Sham". en.eldorar.com. ^ oreusser [@AllyOfTruth] (30 July 2017). "Martyr Usama Suno battalion announces renewal of its allegiance to Ahrar al-Sham, operating in #Idlib" (Tweet) – via Twitter. ^ كودي روش [@badly_xeroxed] (14 October 2017). "#FSA Liberation of #Syria Front: 6 groups that defected from #HTS form new group" (Tweet) – via Twitter. ^ "Integration of "the dawn of the nation" with "free Sham" East Balgoth Rural Damascus". Qasioun News Agency. 12 May 2017. Archived from the original on 19 October 2017. Retrieved 12 May 2017. ^ ""لواء الفتح" يعلن انضمامه لـ"الجبهة الشامية" في حلب" [The "Fatah Brigade" announces that it joins the Levant Front in Aleppo]. SMART News Agency. 8 March 2017. Retrieved 26 September 2018.